This movie has been in my queue for a while now. 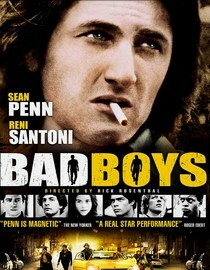 I put it in my queue because of Sean Penn and it stayed there for so long because of this incredibly cheesy line in the description: "On the mean streets of Chicago, Mick O'Brien (Sean Penn) plays by the rules -- the wrong rules." That little gem of a sentence just screamed cornball after-school special to me. If it wasn't for an interesting acting job by Penn and the antagonist Esai Morales this probably could have been an unwatchable movie. Penn and Morales play teenagers trying to make names for themselves on the streets. Each one does pretty awful things to the other and they both end up in a tough juvenile detention facility where most of the movie takes place. It becomes abundantly clear that one of them has to go and the movie builds to an exciting climactic finish. Despite having a predictable plot, this is a pretty interesting movie thanks to the performances from a couple of good young actors. If you're a fan of crime drams, prison movies or Sean Penn you'll probably want to give this one a shot. According to instantwatcher.com this movie will stream until 7/1/11. Why is it in your queue? Sean Penn. Is it artsy? Not at all though it did have a sort of cheesy message to bad news teens. What stood out the most to you? The finale. What mood should I be in to watch this movie? Looking for a well-acted prison drama.